lol!! We call our 6 month old baby Pooh Bear. He is a bottomless pit. Sounds like my kind of Sunday! Honey - EVERYday is cheeseday! One of the first cheeses I couldn't wait to get my lips on in France was the Comte (hard to find in Italy). Still giggling at Honey Jr. the 'big bonbon.' Thank you for the Monday morning smile. I LOVE fondue! I was feeling keenly my desire for a cheese fondue recently, and invited some friends over for one, but they told me beforehand they are not keen fondue fans so we had something else. Talk about disappointing! Will def have one before Christmas! Thank God, I thought my husband was the only one. Thanks lady, way to help me train the new husband. hehe - this looks so good! I don't know Sara, a pantless hottie, (and your hubby surely is a hottie) and cheese-e-goo might just be the ultimate fantasy. Sounds like a perfect Sunday to me! Becca - I never saw the correlation between my husband and Pooh until this morning, now I can't stop laughing about it! Valerie - You're right, in France everyday is cheeseday! And baguette day! Sarah - not being a fondue fan is poppycock! Brenna - And it WAS good! Sarah, I love fondue and in fact I bought a really nice pot to bring with me for our house when we come for Christmas. I have looked for a nice big pot in Avignon and never found one. I know I can do some different cheese combinations there besides gruyere and emmental which is about all we can find here. Our husbands must be brothers...I swear I have seen the Canadian on several occasions bust out with the Pooh and the Honey Pot scenario. He is also a food whore. Last night he crawled into bed and whispered in my ear (at 10 at night only a few hours after we'd eaten) "I'm starving -- I could totally go for some queso right now...". Who says that?! In any case, I heart melted cheese -- I love it!!! Maybe you need to ask for a Fondue pot for Christmas so that this can be a daily occurrence!!! I was inspired to make raclette based on your post--I don't have the proper equipment so I improvised with a George Foreman grill. It may not have been traditional, but it was mighty tasty, especially during a blizzard! You say he's wearing pants like that's a good thing?! Love the husband pic, hahaha! That´s totally what i would do! ahhh thanks to you NOW i understand the difference between raclette and fondue!! cheese whores unite!!! There's never enough melted cheese. Your husband has good taste. Sounds like a fun day. My thoughts exactly girl. When is melted cheese ever not the right thing to have. Thanks to your cheesy influence Jon and I are going to have a cheese themed p New Years party with fondue and we're looking around for a raclette grill. You seriously have made my life more beautiful as all I've had to do was mention this stuff to Jon and he's all about it. Husband and Pooh Bear comparison is fantastic. Does he see the resemblance I wonder? ;-) Bisous! How cute are these photos! Think I might be sticking my hand way down the pot as well...how I miss French cheeses! A big bonjour from California! my husband is a food whore too. and he's thin too. damn him. Sounds like my type of sunday! that is so funny, the cartoon pic :) Do you guys put eggs and kirsch in to your fondue at the end? 3 cheese fondue sounds like perfect food match making! and i like the comparison to pooh bear. Lord, do I love cheese. I am so jealous of your little fondue party. The Pooh comparison is far too accurate. And adorable! Mr. A (my fiance) = TOTAL FOOD WHORE. Great comparison. I'm totally using that in our next food battle. Fondue.....I LOVE fondue. Your hubby has the right idea. Forget the fork and go for it. 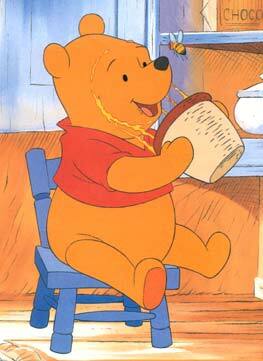 Good photo of Pooh too! Also...have I mentioned how jealous I am? Ha! I see you've been diving into the cheese dishes, too. So delicious. So dangerous. So hard to resist!